Bruno Abate teaching at Cook County Jail. Abate, 61, has been working in the food business most of his life. Born in Naples and raised in Milan, Italy, Abate made his name in the restaurant business when he came to Chicago in 2002 and opened his former restaurant, Folia, on Fulton Market. For the last 8 years, his Wicker Park restaurant Tocco, 1226 W. Milwaukee Ave., has won awards and pleased diners from all corners of the city. But five years ago, his daughter had a friend whose father was in prison in Italy. 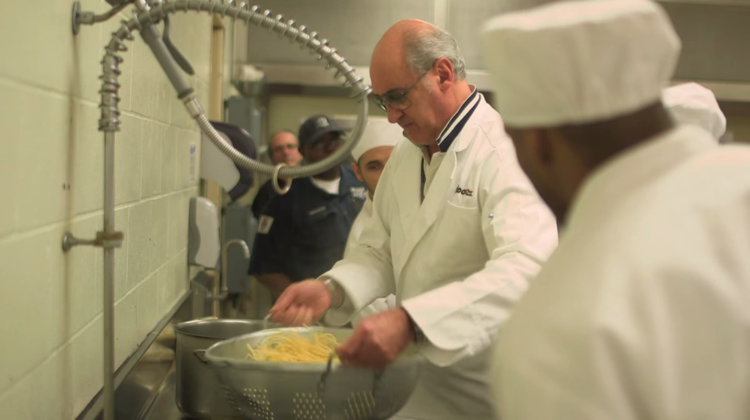 Abate heard the story and learned that the prison there has a program where inmates learn to cook. Then, around that same time, Abate couldn’t sleep at his Chicago home one night and turned on the television to see a program about incarcerated youths in America. He was inspired to create what is now called Recipe For Change, a program that teaches Cook County Jail inmates cooking and other job skills that they can use when they are released. The Chicago Ambassador met with Abate at his Wicker Park restaurant to talk about what inspired him, how he started Recipe For Change, and his ultimate goal for the program. Bruno Abate teaching his Recipe For Change class at Cook County Jail. CA) The story I heard is that four years ago your daughter had a friend in Italy whose father was in prison at Due Pallazi, near Padua, Italy and you learned about a cooking program they have there. Then one night you couldn’t sleep and turned on the television to see a program about incarcerated youths and you got the idea. ABATE) That was five years ago. Something happened that night. CA) What made you decide that you had to do something? ABATE) I didn’t make that decision. God made that decision. I just felt something. I had never been to a jail, I never had anyone in my family in prison. It was far away in my mind. CA) What was the reaction of your family when you said you wanted to work with inmates? ABATE) They were surprised, but happy. My daughter is very happy. It’s a big commitment but everything you bring into your life in this dimension you have to go through and do it. CA) Did you know Cook County Sheriff Tom Dart? ABATE) No, I didn’t know anybody in the prison system. The same day I got the idea a gentleman I hadn’t seen in six years came into the restaurant. Years ago, he had told me that he worked in the prison system and it came into my mind that day, and then at 8 o’clock that night he was in the restaurant. He was one of the supervisors at the juvenile prison in St. Charles [Illinois Youth Center St. Charles]. I talked to him and he introduced me to the director and I started teaching a class there. CA) How long was that? CA) What has been the big difference between teaching the juveniles in St. Charles and the adult inmates at Cook County Jail? ABATE) There is no difference. The only difference is at the juvenile prison there is a lot of mental illness. So that’s kinda hard. But really there is no difference. Nobody knows what rosemary is, nobody knows what basil is, they don’t know anything. It’s like you’re teaching kids. 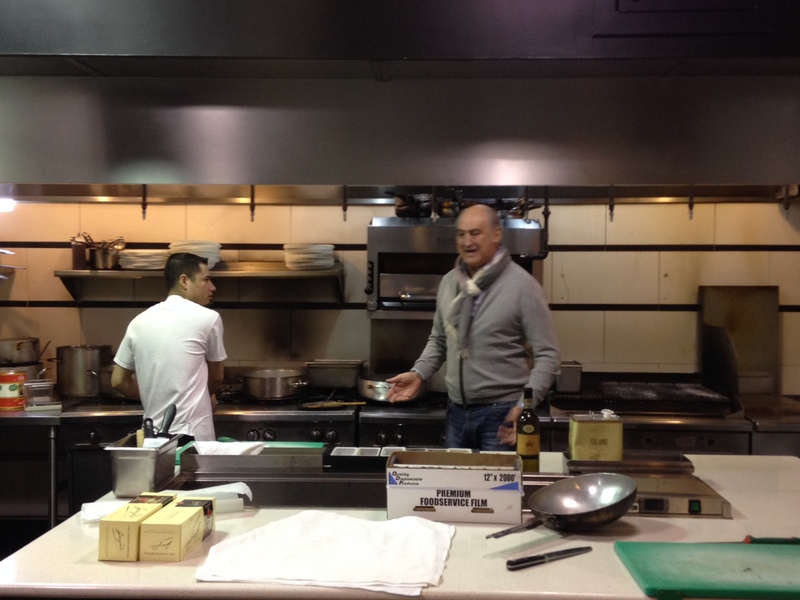 Three hours before doors open at Tocco, Abate is in the kitchen supervising. CA) They have you at Division 11, which houses non-violent offenders. Was that by design? ABATE) No, when I met with the sheriff he told me to go see the jail and look at all the kitchens. So, when I went to Division 11 I liked it and that’s where we ended up. I thought there could be a good future there. CA) You’ve been paying for the uniforms, ingredients and utensils out of your own pocket, correct? CA) How much time are you at Cook County Jail? ABATE) I’m there at least twice a week. CA) The program is 90 days? ABATE) The program is 3 months, but if someone is in the jail longer I keep them in the program. CA) You have a zero-tolerance policy for nonsense with the guys in the program. Has anyone been kicked out? ABATE) Yeah, some guys have. Coming into the program is a chance. I’m not here just to cook. I have the gift of being able to understand people, and I try to make the change inside them through food. CA) Your current class is composed of 20 inmates. You’re the person who decides who gets into the program? ABATE) Yes. And we have 1,400 people waiting to get in right now. CA) Most of the guys in the program are waiting for trial and haven’t been convicted of anything, correct? CA) I talked to Phil Koch, co-director of the documentary that’s being made about your program. He said the film is a long-term project because they want to follow the guys from the time they start the program until they are out on the street hopefully working. He said one of his big challenges is the fact that a lot of guys have been stuck in jail awaiting trial and don’t have bail money to get out before that. ABATE) Right. If you have a good lawyer you can get out. If you don’t, they are quick to say ‘here’s five years, here’s seven years.’ It’s a really sad situation. CA) Your goal is to expand the program? ABATE) The vision is huge, but we have to take one step at a time. The goal of the future is to create a confectionery shop in Division 11. We also want to sell pizza to the inmates and the officers, it will be the only professional pizzeria in the prison system in the world. We are going to do a food truck and we are also looking to find Cook County property to create a big bakery to do croissants, pannetone and all kinds of stuff. CA) So the guys can work there when they get out of jail? ABATE) Yes. They can start the process when they are out an parole or on house arrest. I call it the chamber of decompression. So you go through the program and I teach you how to work from 8 to 5, how to live on $10 to $15 dollars per hour, which is what the majority of people in this country live on, manners, how to deal with people, and confidence. This is preparing you to go out into the world. When I have this, and I hope to have this ‘chamber of decompression’ place, restaurants, hotels, supermarkets can come to us if they are looking to hire people. CA) You’ve hired a couple guys but you can only hire so many, correct? ABATE) Right. I wish I had more business so I could hire more. There is a lot of demand though in the industry. I have a lot of contacts as well. CA) Can you keep teaching every class in the future? Are you looking for more help with teaching the classes? ABATE) We definitely are looking for more. The goal now is to finish the kitchen at Division 11 so we can invite more chefs to give demonstrations. It’s a way for people to see that these are human beings and not animals. When you talk about people in jail most people don’t have a good opinion. I don’t even speak English well, but I got into the prison system and I changed a lot of things. Rehabilitation in the prison system is key. The punishment is not the key. We are generating more homeless, more mental illness, 8,000 people die in the prison system a year, 3,000 commit suicide. What are we going to do? It’s crazy. The key is rehabilitation. Give these people back their dignity and let them know that they are human beings. People make mistakes. A lot were born in different places, not like you or me. To find out more about Recipe for Change, click here. To find out more about the documentary film being made about it, called “Serving Time,” click here.